Hello and welcome to another munchkin meals! Hailey’s eats have been a lot of the same lately. I share a lot of what she eats on instagram and facebook if you’re interested. Somehow in between mental breakdowns (thanks for all the love on my last post- so glad I’m not alone! ), I found some time to play in the kitchen. Next time I’ll share Hailey’s meals and snacks, but this time I couldn’t help but to get in the spirit with these fun kid-friendly party snacks! Cheesy Reindeer- White cheddar cheese wedges. The antlers are made tiny twist pretzels that I broke apart. The nose is half a green olive and the eyes are peppercorns. 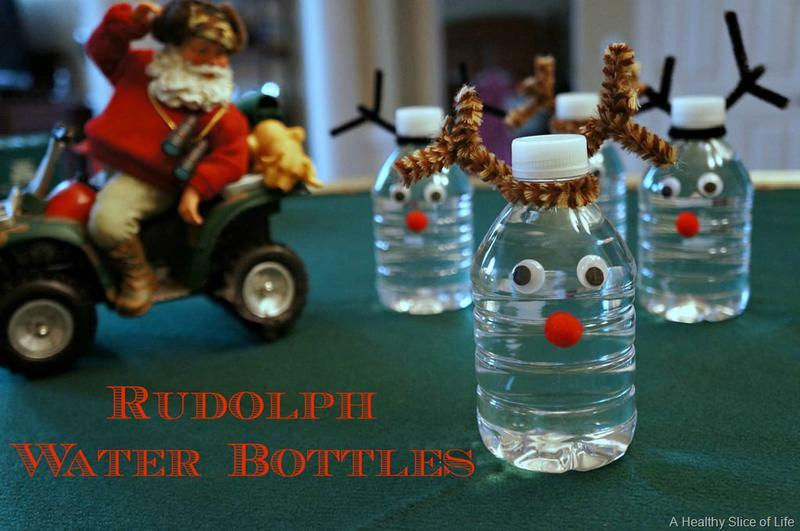 Rudolph Water Bottles- I’m seriously not a craft person, but these were so easy! 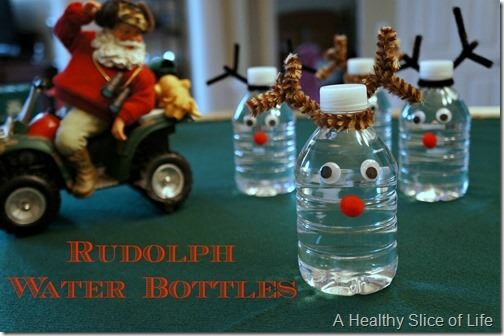 I used a hot glue gun to glue googly eyes and a red fuzzy ball to the mini water bottles. 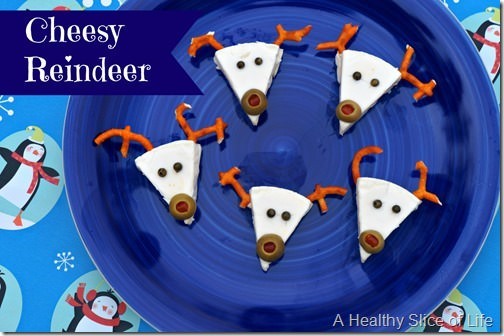 Then I cut pipe cleaners to twist and create antlers. 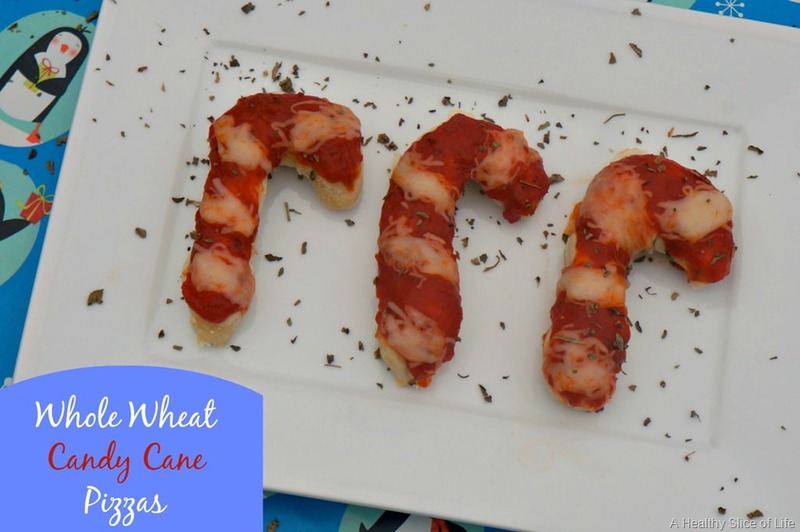 Candy Cane Pizzas- I used my whole wheat dough to bake candy cane shaped pizzas. Then I topped with pizza sauce and sprinkled cheese in a candy cane pattern, then baked until done. You could always use pepperoni, tomato slices or red peppers to create the stripes on an all-cheese candy cane pizza too! Banana Snowmen- This is a great one to get the kids involved with! Slice bananas (slice them thick so they don’t break apart when you kabob them onto lollipop sticks!). Use chocolate chips for the eyes and a tiny real carrot slice for the hose. Two pretzels make arms and the festive hat is made from an apply slice and a blueberry. Hailey thought these were hilarious! 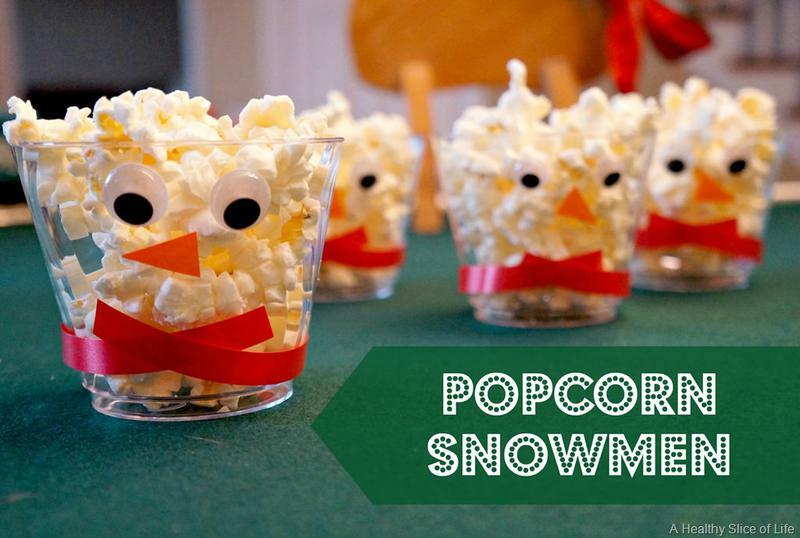 Popcorn Snowmen- Again with my handy dandy glue gun! More googly eyes make these popcorn cups fun and silly. The noses are made from orange construction paper, then I used a bit of red ribbon to make a scarf. 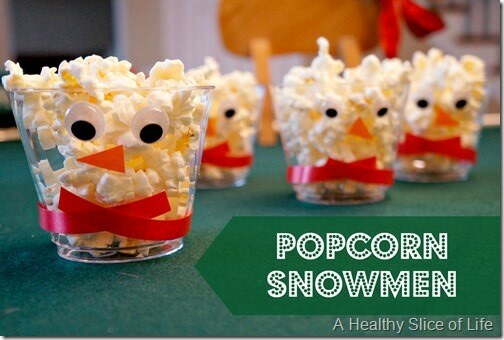 Fill it up with popcorn for a healthy, festive party snack! 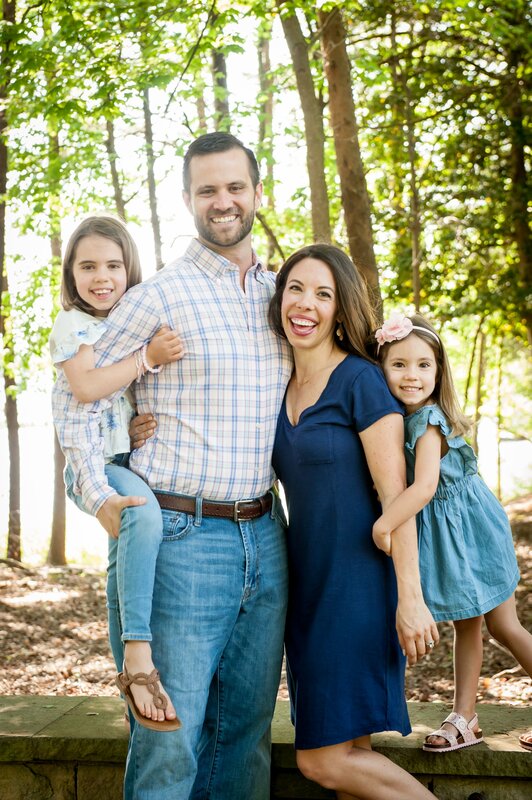 Click here for more posts on kids’ food! I’m sure people are busy during this time of the year, but if you’ve posted about what your kids are eating, please link it up! OMG those are the cutest ideas ever! You’re so creative! So timely! We have a playgroup Christmas party coming up that I’m hosting and I was thinking I needed to look around for some healthy and cute party snacks. So cute! I am struggling with feeding my picky 15 month old, so I will be happy to visit these link ups. 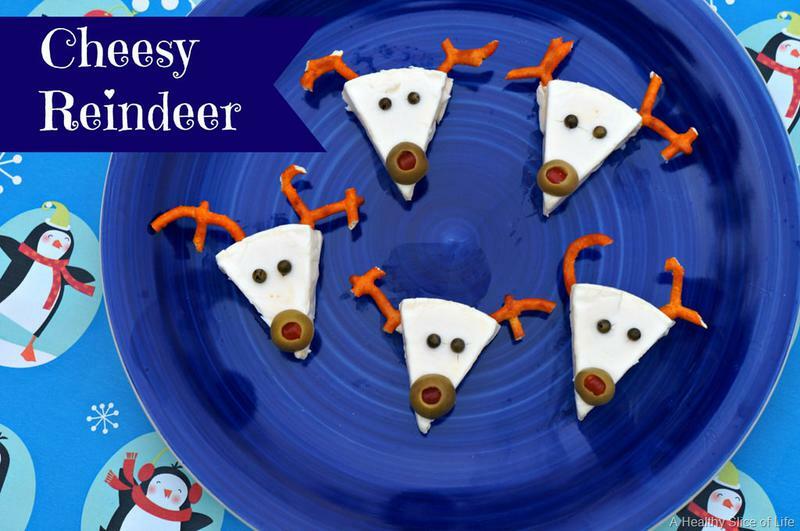 Oh man, the cheese reindeer is adorable! I’m going to make one for sure. oh my goodness so cute! I’m adding cheese wedges to my grocery shopping list to make this weekend! How fun! These ideas are just the cutest! Those ideas are really cute. I especially like the candy cane pizza and the snowman!! Ali recently posted..Nine Months Old! SO cute!! I wish I was that creative!! OMG! So cute! 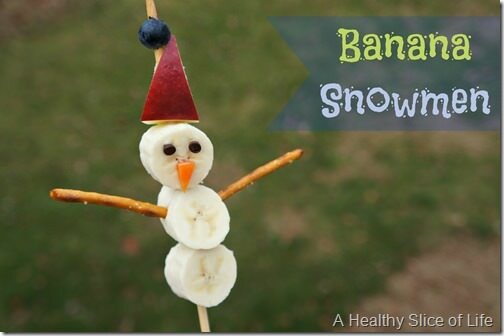 I am so going to use these – especially the banana snowman! MacKenna is LOVING snowmen and Santa lately – maybe this will get her to eat some healthy foods! And the pizza – too cute! Does Hailey just eat the LC cheese straight up? Or does she use crackers to dip them? Pinning all of these! Love! Ahhh! How did I miss the link-up again! I missed last month too. 🙁 Did the day change from the first Thursday of the month to Wednesday?? Either way, here’s the link to my Munchkin Meals, this month. I love all of the little holiday foods you’ve created. They’re all adorable and look yummy. You’re awesome!! Thank you so much for reopening! Those are SUCH cute food ideas! I’m definitely going to show my wife. She is a nanny and would probably love to do these with her boys.